Silver Bells... to the Press Box! Just in time for tree-trimming and family gatherings in front of the fireplace, Drum Corps International has just released a new seasonal audio product on the DCI Fan Network. 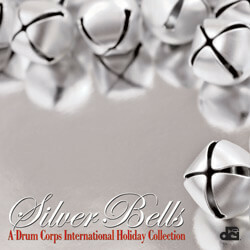 This exciting package includes 10 "classic cuts" of your favorite holiday music from World Class performances spanning the history of Drum Corps International. For only $3.49 ($2.49 for Fan Network subscribers), this sparkling collection makes a great addition to your MP3 player this holiday season! Also, be sure to visit the Fan Network for your FREE download of the classic Phantom Regiment studio recording of "Amazing Grace," originally recorded for the DCI "Ornaments in Brass" collection. We hope you'll enjoy this performance as our gift to you for your continued support of Marching Music's Major League?„?.